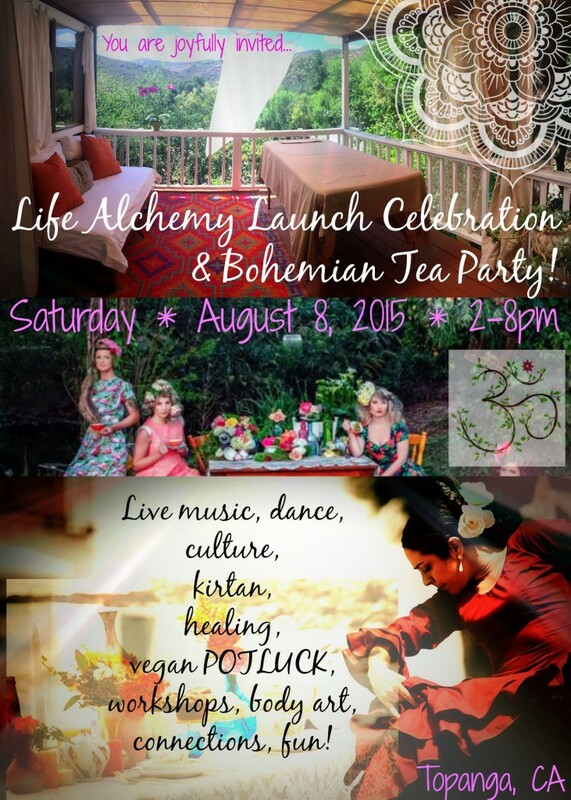 Life Alchemy with Haley is collaborating with the spirit, individuals & community of the Bohemian Tea Party & many talented sacred artists from Topanga and beyond. We are so grateful for all of the big hearts, including YOURS, coming together to co-create this uplifting day. * Your good vibes, authenticity, creativity, and openness. Flowers & imagination welcome! * Cash (check or cc) for goodies, services, & raffles! Hands-on Natural & Ayurvedic Healing, Beauty, & Body Art/Henna throughout by the beautiful, talented, & knowledgeable ~ Apsara Beauty & Health Julianna Kaufman, Thani Ayurveda, Awakening Yogi Jenny Ahn Yours Truly (Haley), and more. Life Alchemy is the vehicle for Haley’s unique perspective unifying the body, mind, & soul through ancient and modern natural techniques for healing, optimal evolution, and creative realization. Through yogic disciplines, arts, & creativity, wellness & growth as individuals and part of a collective can lead to a happy & healthy society. Embodying Love, we are empowered to elevate our experience ~ and our existence.